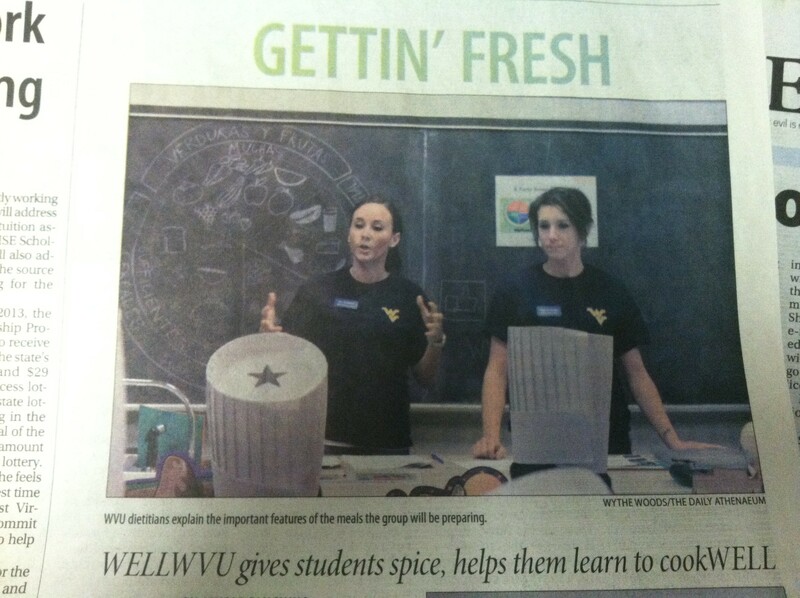 ISPP Dietetic Interns made the front page of the DA newspaper! 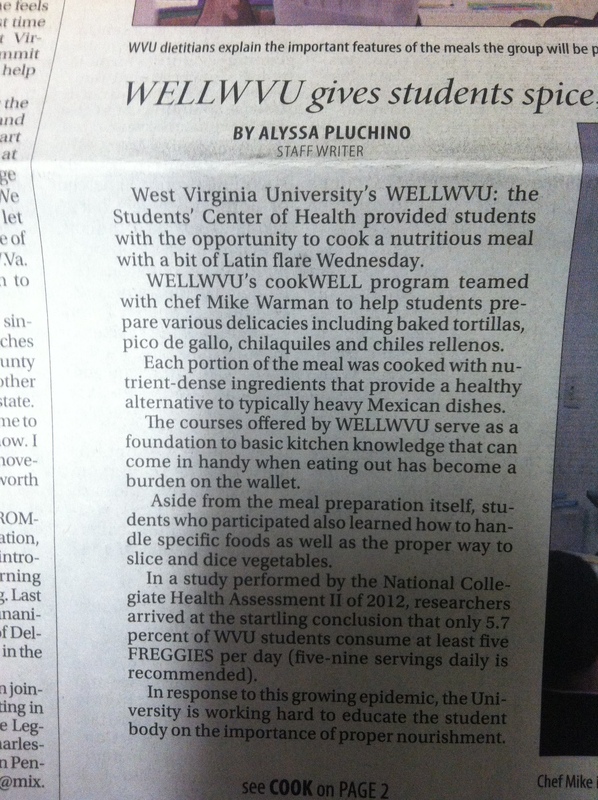 On Wednesday January 30th, 2013, WELLWVU partnered with our Didactic Program in Dietetics at and we launched our first of four healthy food culture cooking classes on campus. This program planning started in the Fall 2012 semester. At that point, the program was initially a graduate student’s responsibility to plan, organize, and delegate but with hiccups in the way- WVU’s ISPP Dietetic Internship came to the rescue! 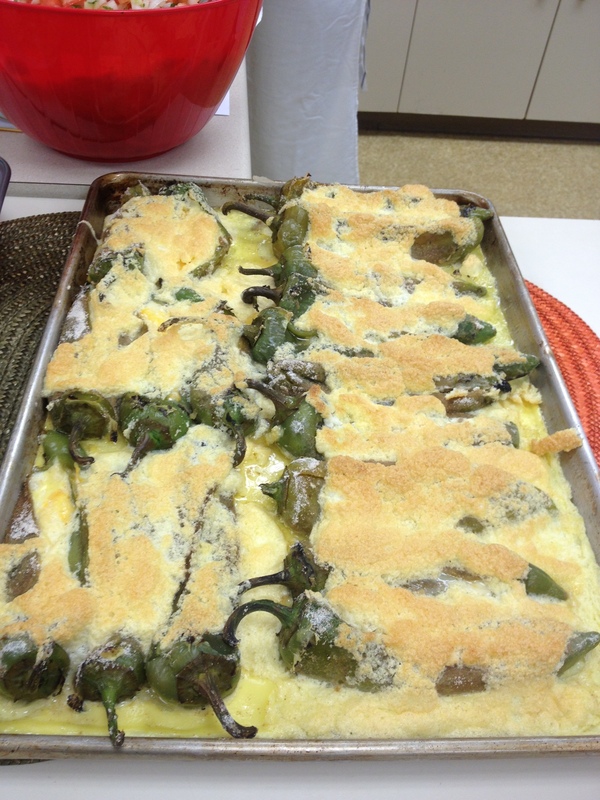 When we originally found out that Kaylyn Crosier and myself were going to be running the series of education programs that entailed nutrition and culinary skill-building, we though- why not incorporate food culture? Everyone loves learning about different food cultures but, this will make the series even more interesting, with the added culinary and nutrition components. So, for our launch event- we decided on Mexico as our theme. 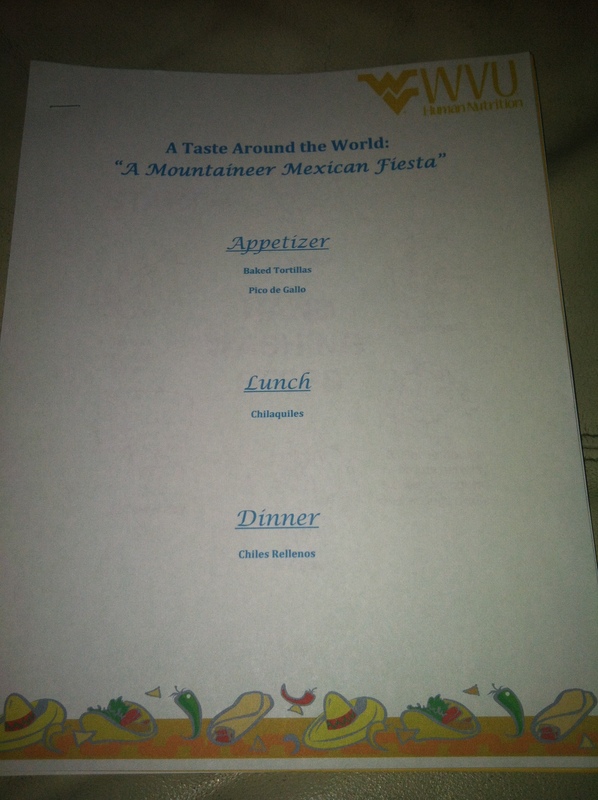 In fact, A Mountaineer Mexican Fiesta. There was an estimated 25 students who were going to participate. 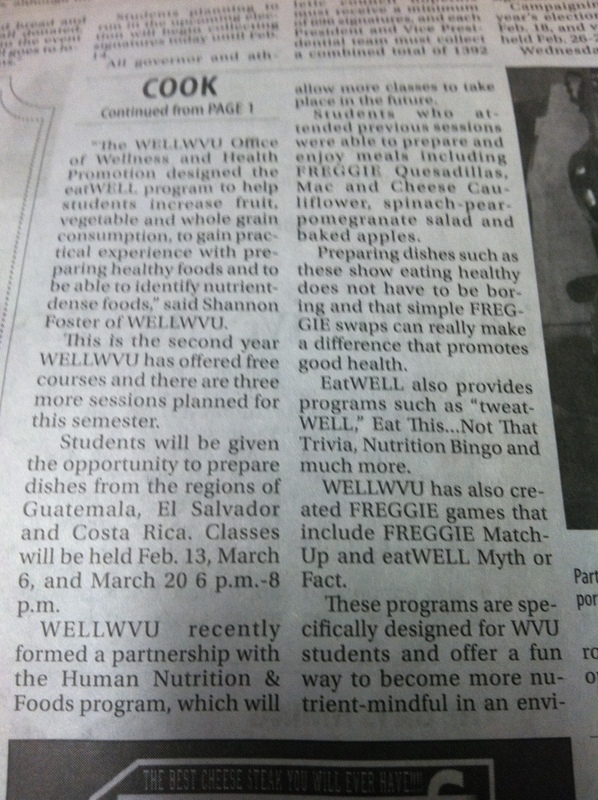 WELLWVU purchased our groceries the day of the event. 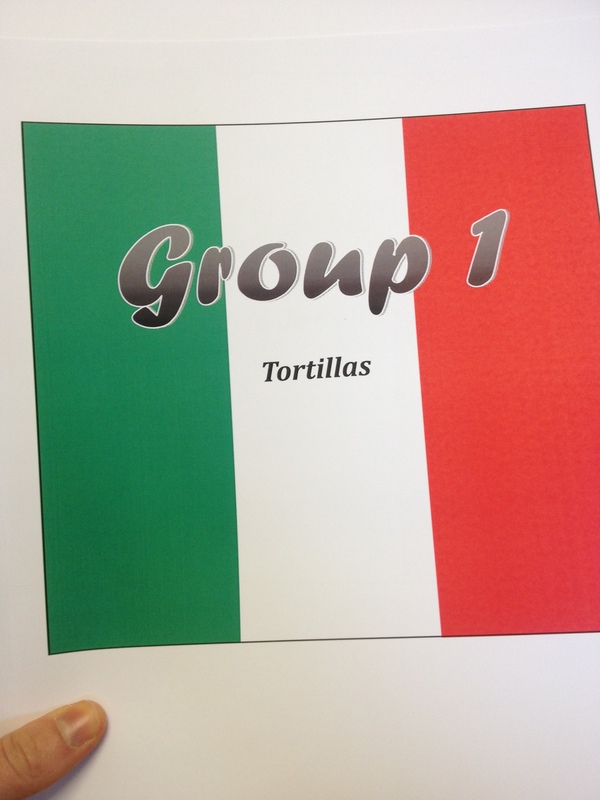 A created packet was given to each participant. 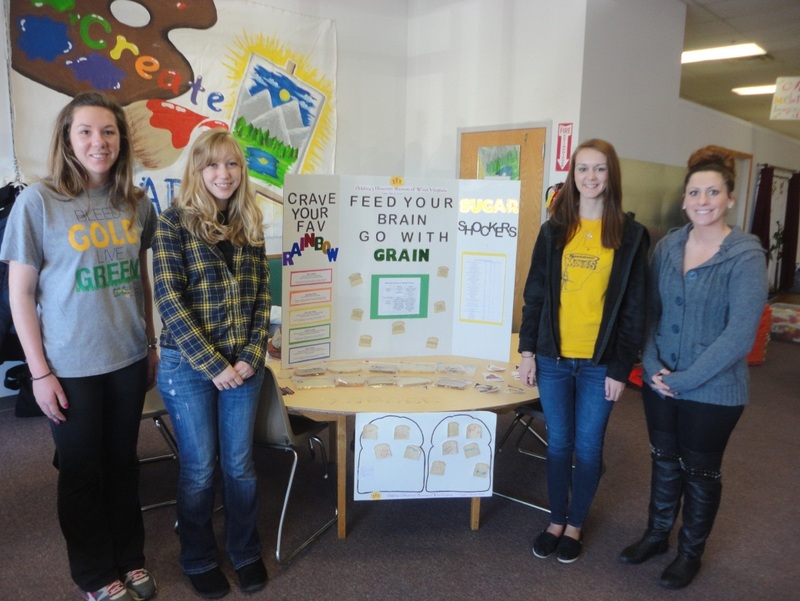 The set-up for the event entailed the aid from 2 undergraduate interns from our Human Nutrition & Foods department. 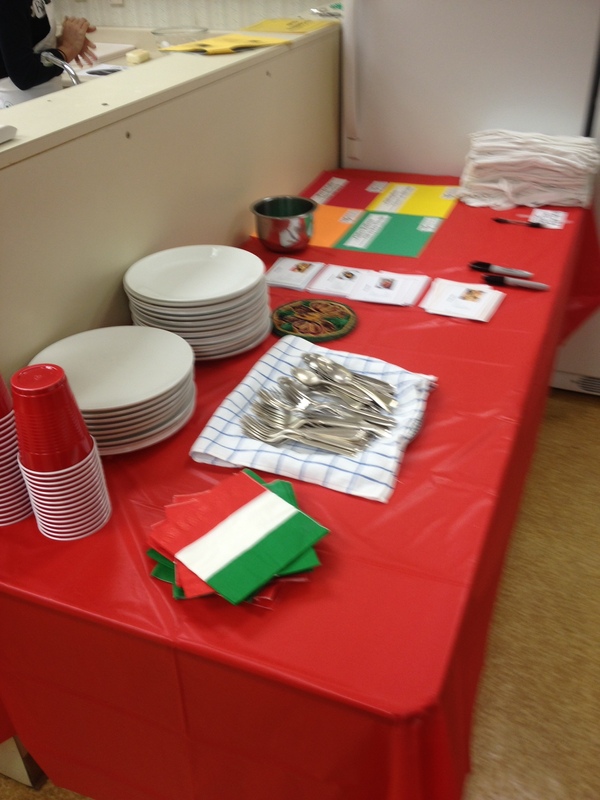 We were responsible for setting chairs out for participants, hanging signage for each kitchen unit, setting out all kitchen utensils/tools at each unit, hanging decorations. I created signs for students to pronounce menu items correctly, the program packets, the food guide pyramid signs, and delivered decorations for the Ag Sciences Annex Test Kitchen. I arrived at the kitchen at 3pm, the program lasted 6pm-8pm, and I eventually exited the kitchen at approximately 9:45pm. 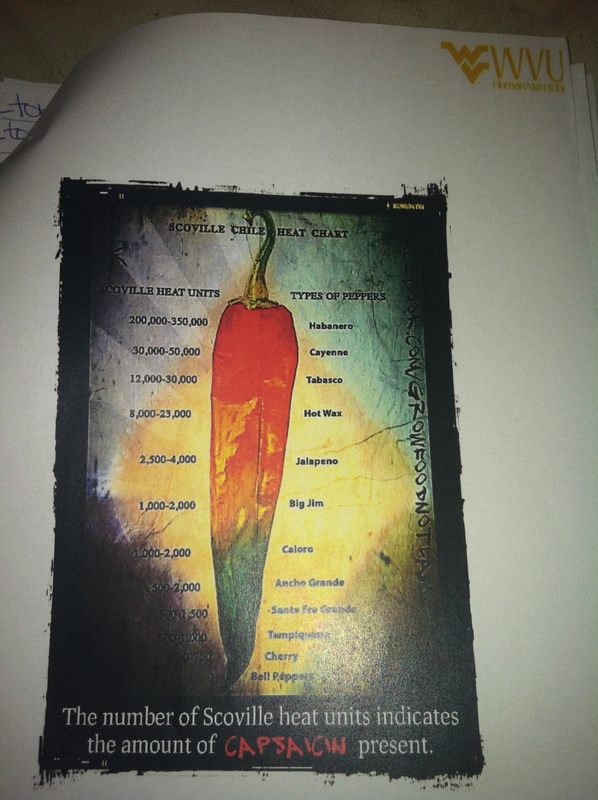 One of the signs used in our presentation on nutrition. This was utilized/created to increase student’s culture awareness and pronunciation. 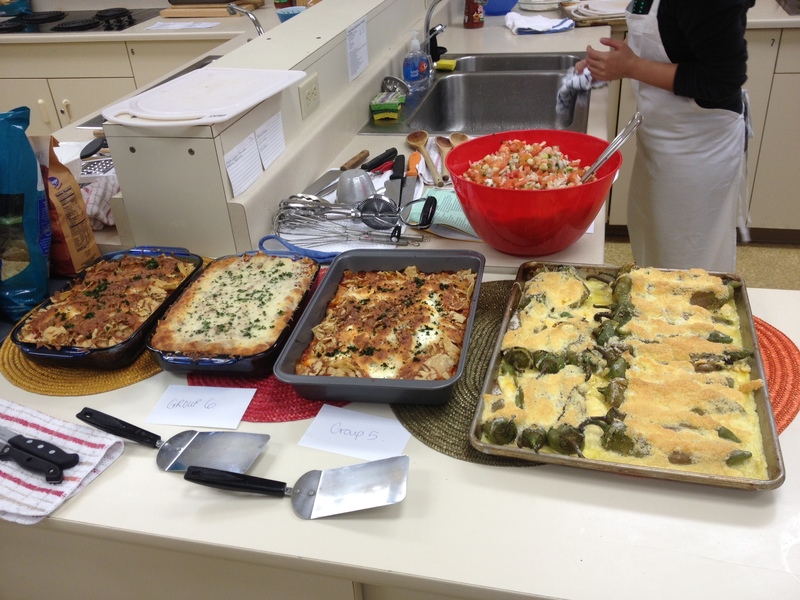 The class’s cooking experience was complete! Time to eat!! Ole’!! 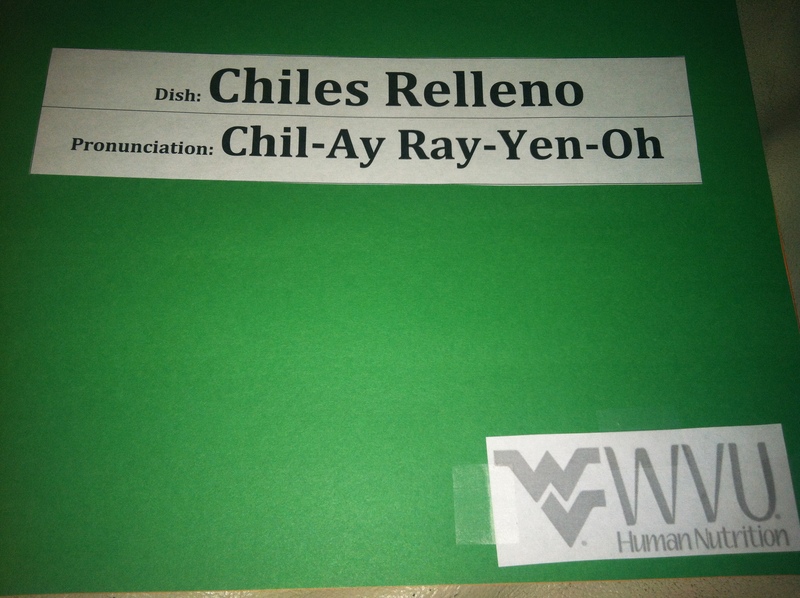 So, this past week was quite an eventful one at that for this WVU ISPP Dietetic Intern. I had the pleasure of administering a mini kitchen audit to ensure the WVU Agricultural Sciences Annex Test Kitchen had the tools, equipment, and utensils for an upcoming event that week. 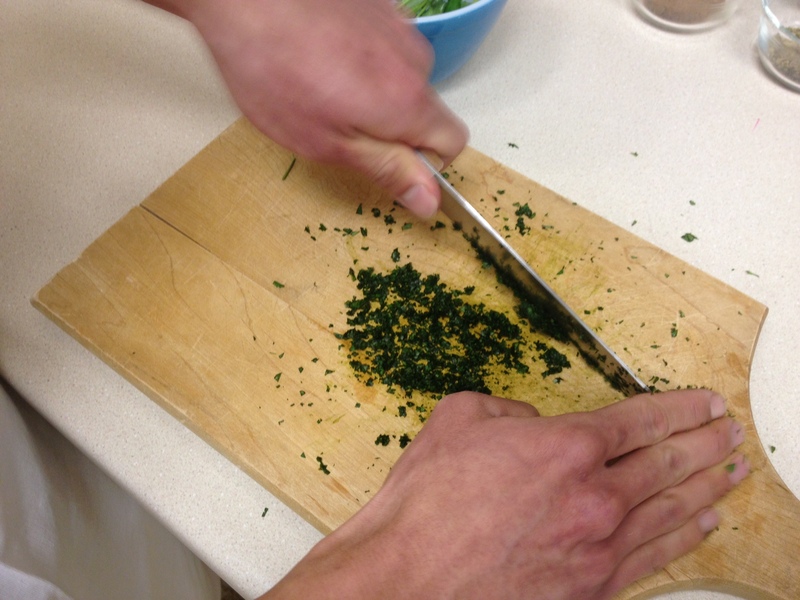 Initially, this kitchen audit was intended to be administered by our program’s graduate student, who is a professional chef. But, when the audit was abandoned, I stepped in to do just a brief audit. 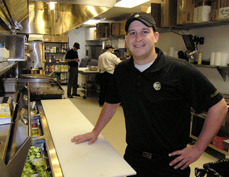 Our kitchen holds roughly 25 students and has 4 kitchen units. Within each unit, there are 2 sinks, 1 microwave, 1 stove, and holds 4-6 people. Each unit is really broken into 2 stations and has a set amount of kitchen tools within it. In my mini audit, I was just ensuring that we would have enough knives, cutting boards, and utensils to complete a program for that week (which you will read about soon). 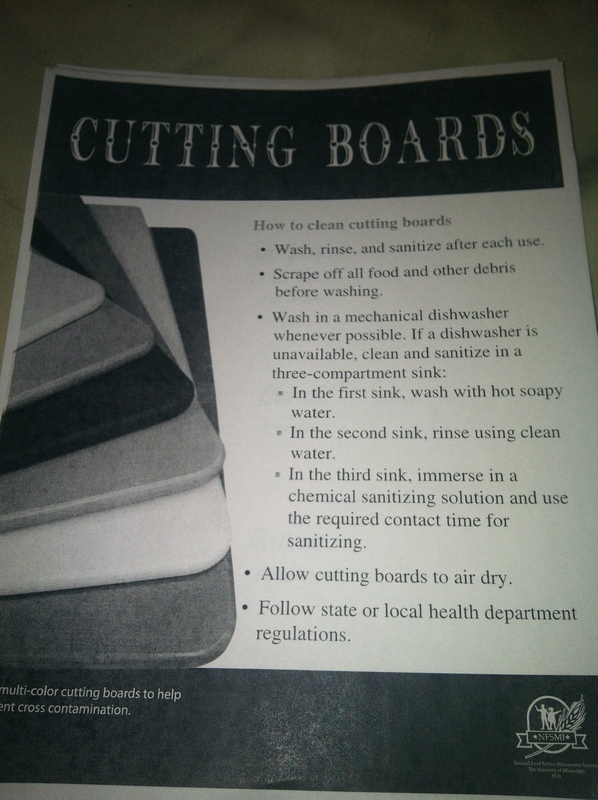 The number one concern that I was aware of, when running the mini audit, is that the knives in our kitchen are really dull, which could cause potential serious injury to beginner cooks. I also noticed that there really wasn’t a standard list of equipment in the kitchen, as a whole or at each unit. 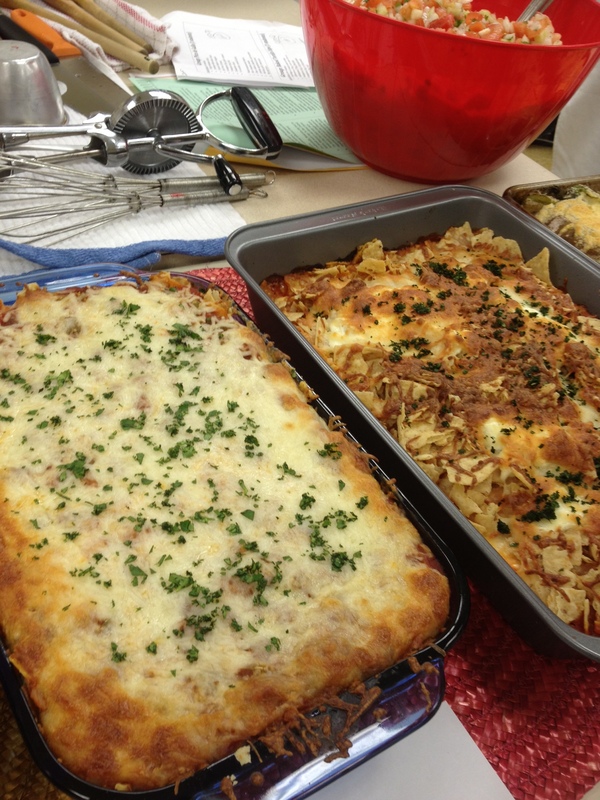 This could potentially be the reason why kitchens become unorganized at times. Another red flag I observed was the poor quality of a first aid kit that the kitchen had. They kept the kit in a drawer, unorganized, nothing in one container, and I think the components of this “kit” were outdated towards up to 7 years ago. 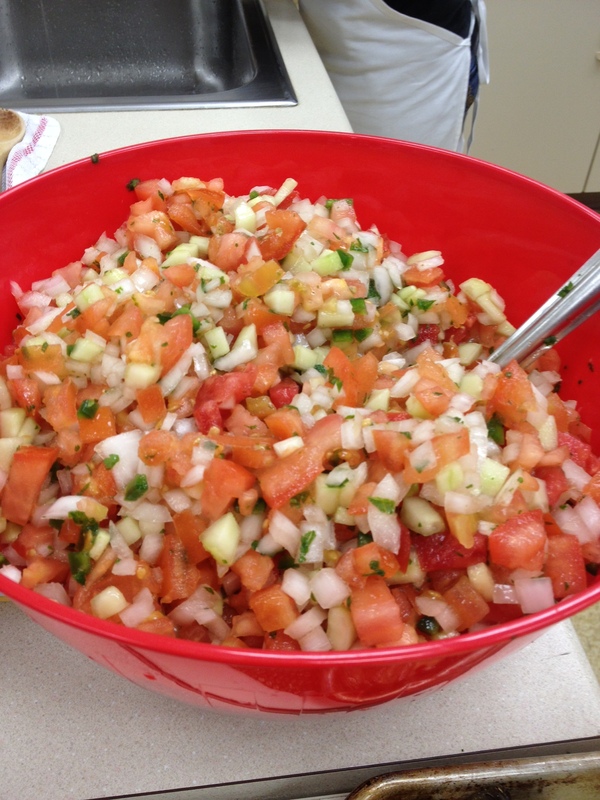 These things are really important when teaching nutrition education in a kitchen setting, especially with students who have never stepped foot in WVU’s Test Kitchen. 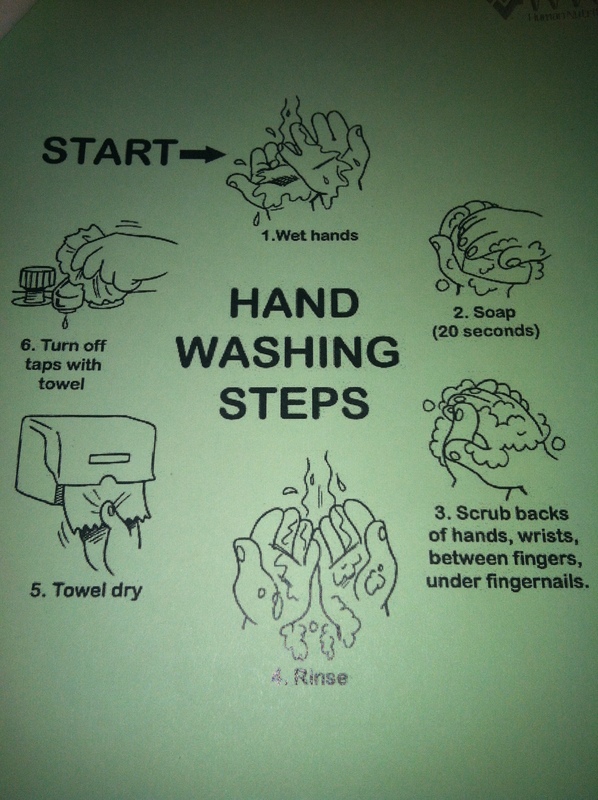 Hopefully, these problems will be addressed before we run our next programming in the kitchen. I definitely think that our program should require students to have training of some extent in “how to run a kitchen audit”. I think it would be beneficial for future use and educate students the importance of knowing what’s in your kitchen so, you can identify any gaps or holes for future programming. 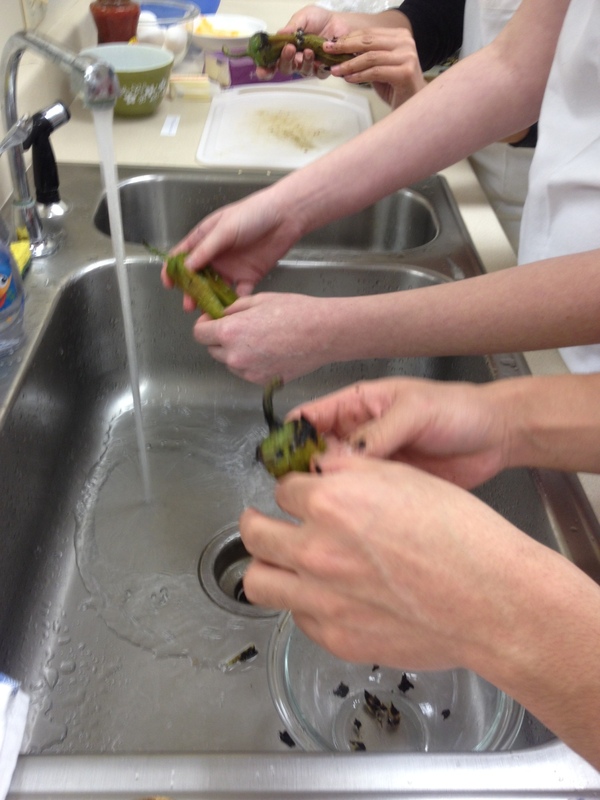 Experiences like these are ideal service learning opportunities for students at every level. These events give students exposure to children of younger ages and also practice their community nutrition skills, away from campus-aged individuals. – Small pieces of paper cut in the shape of slices of bread. Then, we had the children write, or write with the assistance of our volunteers, their favorite type of grains. – Slices of different types of bread in small plastic bags, labeled. And the same slices of bread in plastic bags, numbered on the back. This was our version of a matching game. We instructed the children on matching the slices of bread to its matching mate. – Small printed pictures of grains and an assortment of other (non-grain) food and/or beverages. Then we grouped the pictures in sets of 3. One picture was a grain and 2 pictures were not grain. 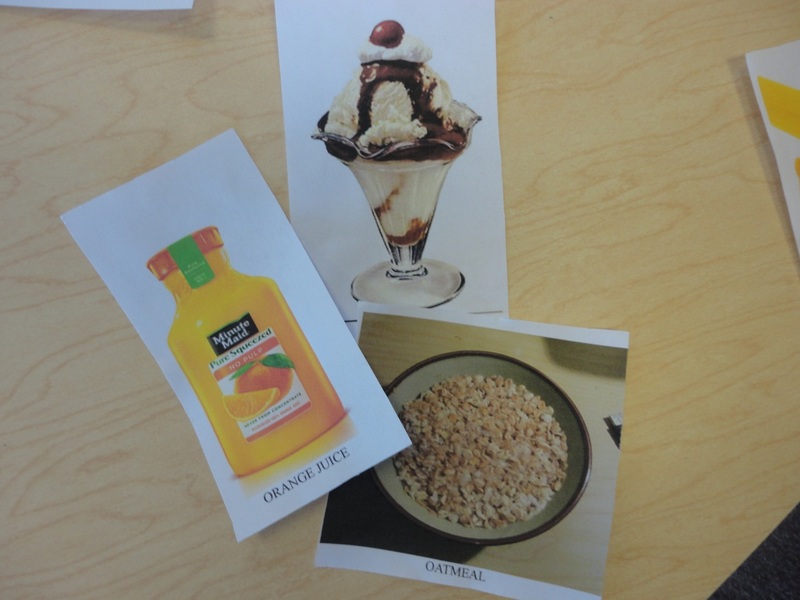 Then we instructed the children to identify the grain in the group of pictures. This gave the children product and food identification of grains, hopefully to use later on with their parents in such places like grocery stores. 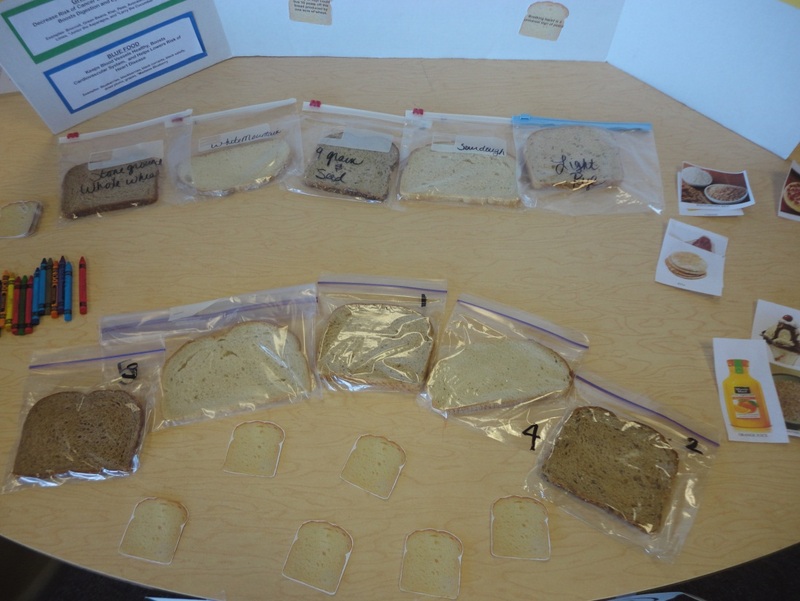 A game created for children to match the different types of breads to their matching type of bread. The bread on the top was labeled. 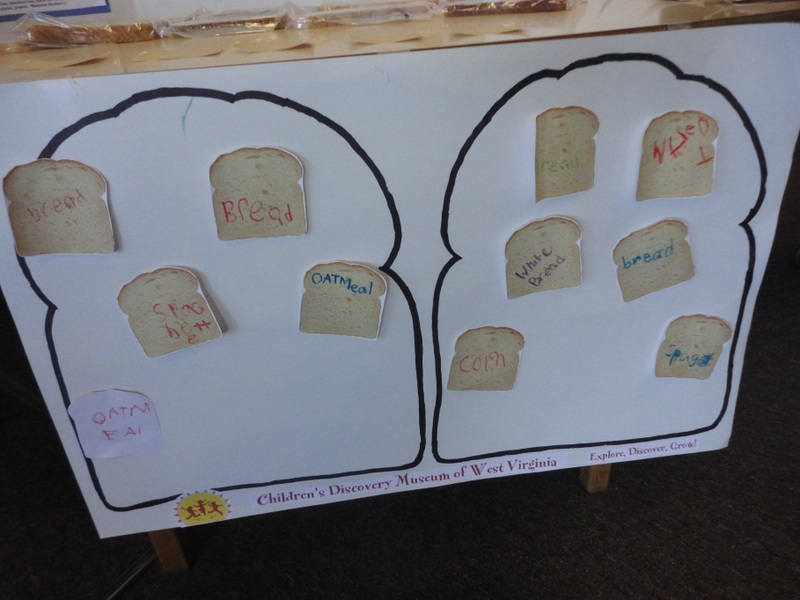 The bread on the bottom were numbered on the back, so children couldn’t identify the correct answers on their own!